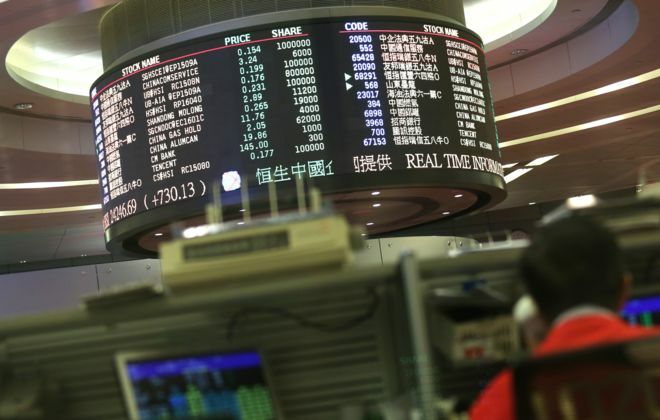 In Japan, the Nikkei Stock Average NIK, -0.43% lost 0.4% after a day of volatile trade and set another four-month closing low while falling for the 12th session in 15. Japanese stocks started the day modestly higher but then weakened as the yen USDJPY, -0.39% rallied and hit a 15-month high against the dollar at around ¥106.85. That pushed the Nikkei down as much as 1.4% but in afternoon action the decline was fully erased as the dollar pushed back up to ¥107.25. In Hong Kong, the Hang Seng index HSI, +2.27% surged 2.3% and South Korea’s Kospi SEU, +1.11% rose 1.1%. The Kospi was helped by a 3.1% jump in Samsung Electronics 005930, +3.07% . That put the electronic giant’s gains for the week at 9.6%, which erased most of the month’s decline. Markets there are closed for the rest of the week for the Lunar New Year holiday. In Hong Kong, index heavyweight Tencent Holdings 0700, +2.65% has gained 6.4% this week, nearly halving its February pullback. Chinese equities SHCOMP, +0.45% reversed modest morning declines after two days of strong gains ahead of the holidays. China’s markets will be closed from Thursday until Feb. 22. The NZX-50 NZ50GR, -0.78% closed down 0.8% as Fletcher Building FBU, -9.27% slumped 9.3% to a two-year low after it revealed additional losses at its building-and-interiors division. Trade in the company’s shares were halted for nearly a week after Fletcher said Thursday it expected more red ink for the segment. Australia’s S&P/ASX 200 XJO, -0.25% eased 0.3%, reversing some of Tuesday’s rebound. Commonwealth Bank CBA, -0.43% the country’s biggest lender, started trading ex-dividend Wednesday, reflecting the company’s upcoming payout to shareholders.